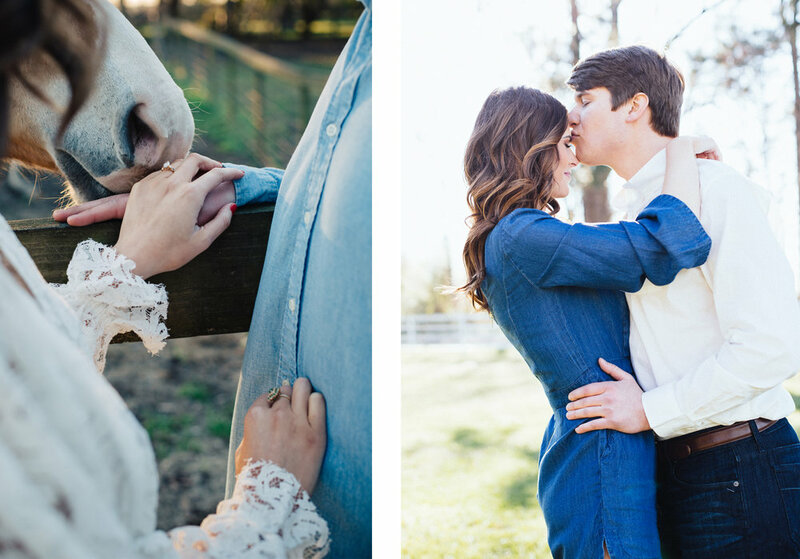 Wow, what a beautiful today for an outdoor engagement session. The sunshine and beautiful green oasis at the Ashley-Alexander House was ideal. Brooke and Trevor are planning a gorgeous and intimate outdoor ceremony at the same location so we knew we had to take advantage of the summertime scene. The horses even ventured out of the stables to greet us. It was a truly wonderful opportunity to be trusted to capture their special relationship and we laughed A LOT. I know what you're thinking... they're cuteness is a tad overwhelming. But, hey, what are you going to do? They're perfect for each other. I absolutely cannot wait to see these two tie the knot! Also, isn't Brooke's wardrobe on point? I must say, she looks stunning in these photographs! The photo below is probably my favorite from the shoot. The universe aligned for this one. I could post every single one of these, which might still happen... ;) But for now, I will leave you with these gems. Don't forget to Like Us on Facebook at https://www.facebook.com/charlieandolivia/ and Follow Us on Instagram @charliexolivia for more photographs and updates on the world that is Charlie & Olivia Co.